The President of Techniglass Corporation and designer of THE GRINDER is an engineer by day and glass artist by night. When designing The Grinder with the engineering team, he was determined to address solutions to various glass grinding issues and bring the market an exceptional and highly engineered, precision instrument for the professional artist, as well as the discriminating hobbyist. 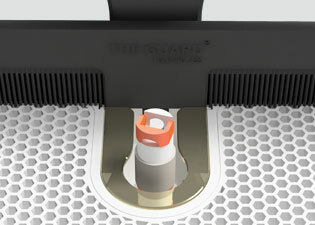 Techniglass proudly delivers comprehensively advanced features and accessories for the ultimate glass grinding experience. Accessory Drawer and Tray Insert – An exclusive, compartmentalized, and built-in drawer is a space saving way to store spare bits, included scraper, Aqua Flow System, replacement brushes, stainless steel bit guards, and other tools! 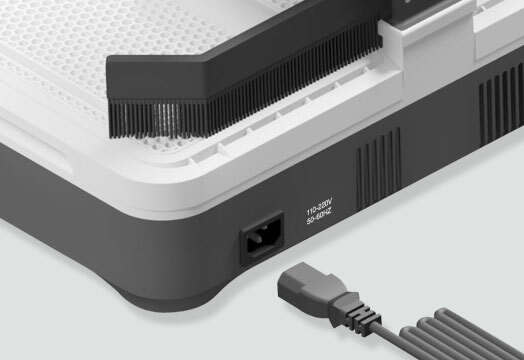 THE GRINDER is equipped with a 6 ft. (1.8 m) durable and removable 3-prong cord which meets international standards and is 110-220 VAC compatible. 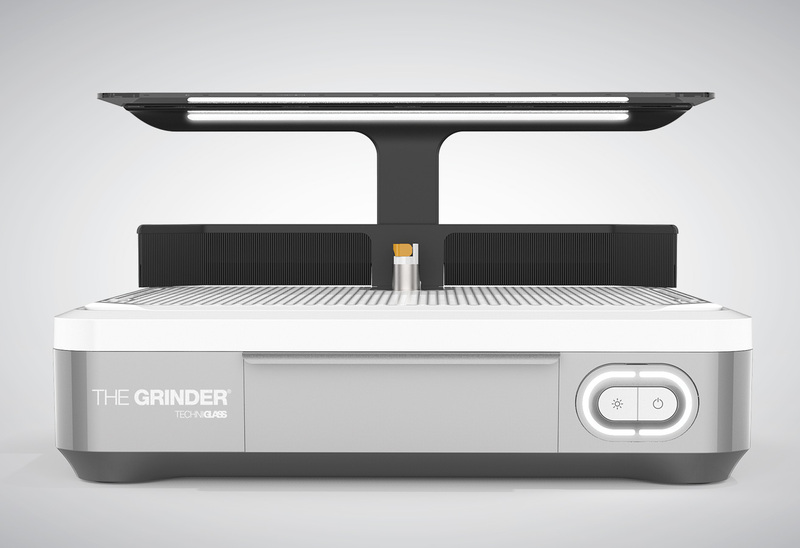 An innovative glass grinder for an exquisite glass grinding experience. To eliminate the muss of scalloped or rough edges, and the fuss of carrying your grinder to and from the sink, THE GRINDER, in combination with BIT Central’s innovative grinding bit heads, provides a machine that is maintenance bliss and a vibration-free, smooth grind! 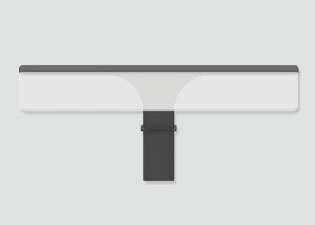 The Lumishield is an illuminated, lens-grade eye shield which can be easily attached. This high visibility shield provides protection from minute glass particles that become airborne and casts an even amount of light across the work surface area. 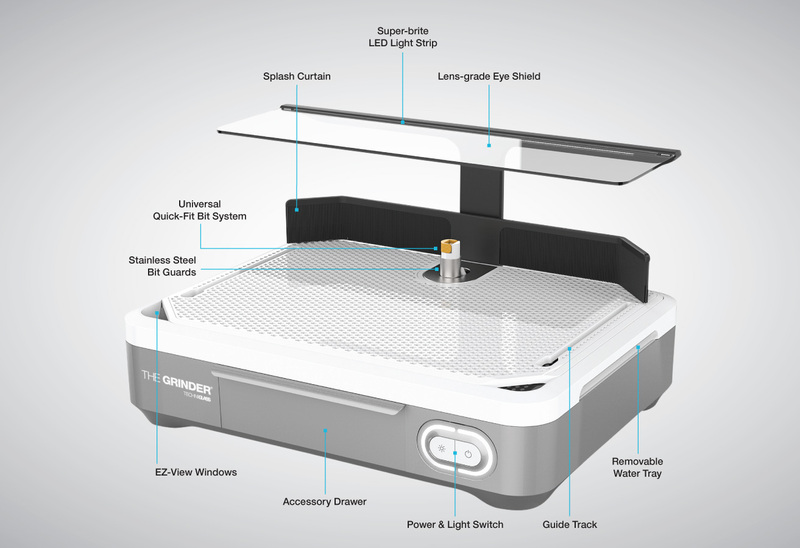 It is equipped with an energy efficient, super-brite LED light strip to best illuminate the project you are working on. The Guard is a wear resistant splash curtain designed to keep the studio clean and dry. 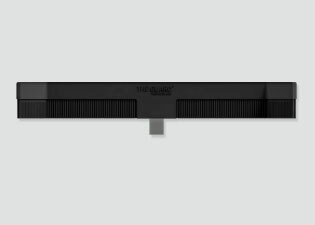 The Guard is a wear resistant, flexible material that detaches easily for cleaning. Glass pieces of unlimited size and length can easily slide through the bristles which capture debris and return water to the reservoir. 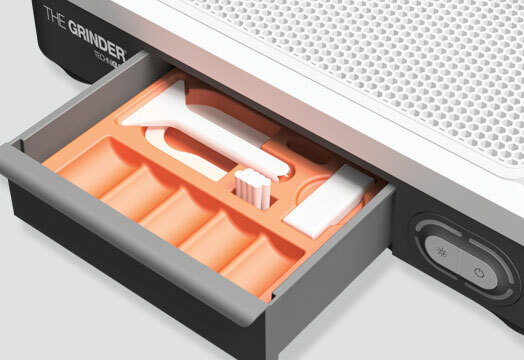 Unlike other grinders, the water reservoir comes equipped with a removable tray which can be easily emptied after use. 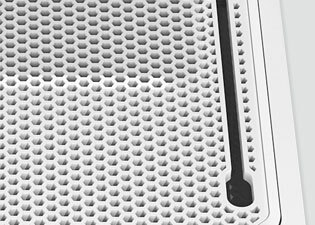 With handles on each side, the lift-out tray makes cleanup simple and safe. Eliminate carrying a heavy awkward grinder to the sink or potentially spilling its contents on floors and work surfaces. Any accumulated glass grit can be cleaned out with the included scraper and disposed of or repurposed. 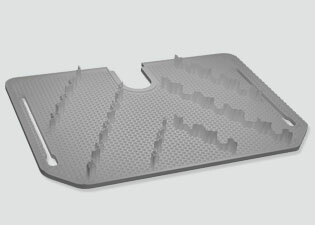 The uniquely designed main grid has incorporated supports and baffles on the underside to stabilize work surface and limit water movement during tray transport. It’s important to keep a sufficient flow of water to the bit head while grinding. Reservoir water level can be continuously monitored through the EZ-View Windows. 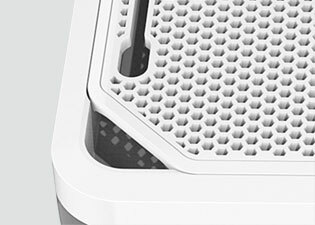 The Lift Grid easily removes for addition of water or cleaning with the smartly-designed cutouts. Made from durable stainless steel, bit guard allows interchangeable usage of ¾” and 1″ grinding bit sizes. THE GRINDER is equipped with convenient channels located on each side of the working surface for attaching tools. The secondary platform with water reservoir can be effortlessly placed atop the main grid enabling use of 1/4″ and 1/8″ spindle top bits. 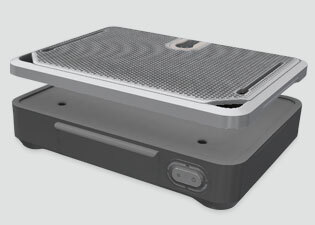 Equipped with its own reservoir, the secondary platform has water ingeniously delivered to the grinding head for flawless execution. The reservoir water level can be continuously monitored through the EZ-View Windows. 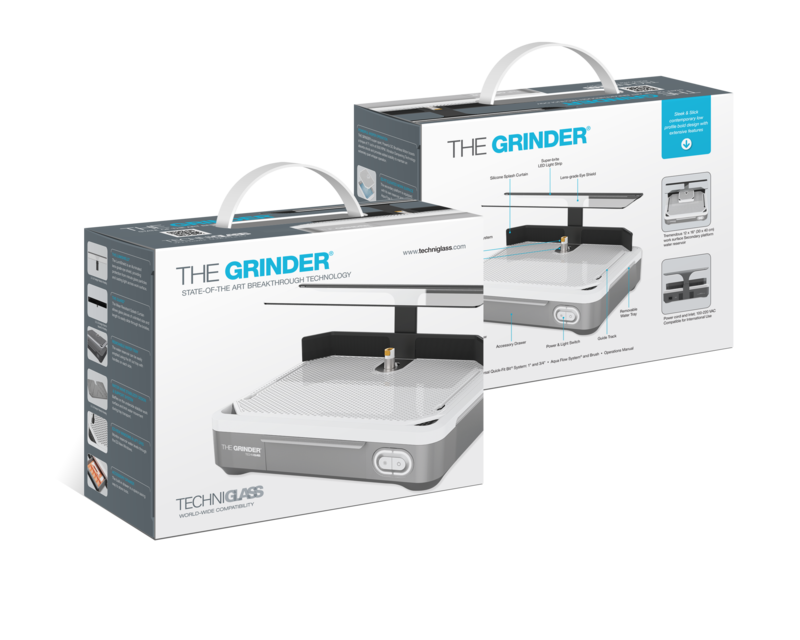 The only glass grinder designed with worldwide compatibility is fitted with an extensive number of features and is the most powerful, solid state motor for a premier grinding experience. From keeping the studio clean, to ease of maintenance, THE GRINDER has been developed, to ensure all creative needs are covered.